All is set for Ashanti Region to host the 20th Vodafone Ghana Music Awards nominees jam today (Saturday, April 6). The capital city of the region, Kumasi, will groove to the beats, rhythms, sounds and lyrics of some of Ghana’s favourite stage performers. 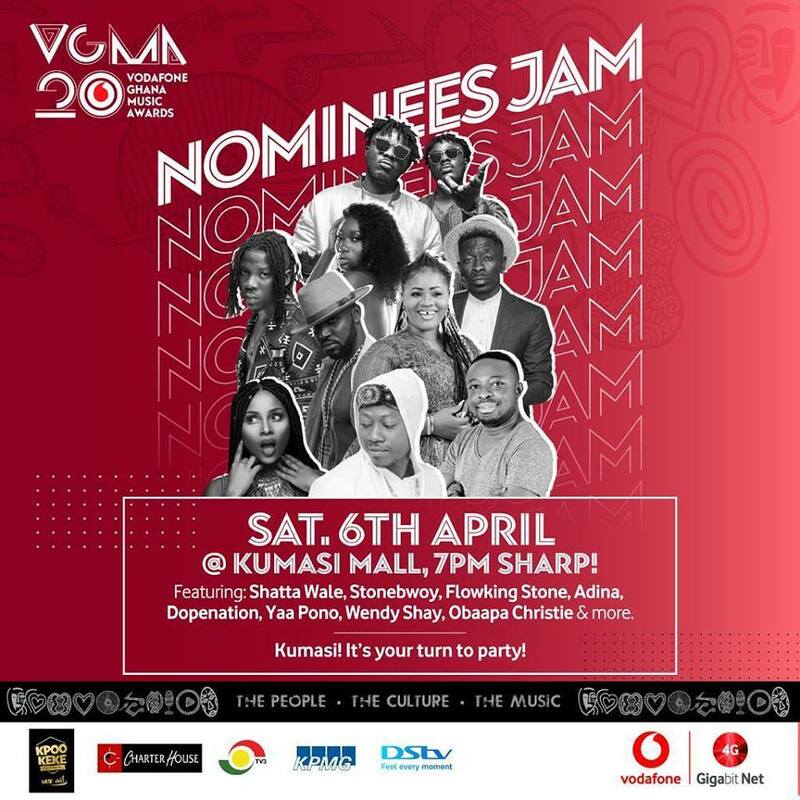 The Garden City is hosting the nominees jam after sevens of hiatus – and according to the organisers, Charterhouse Productions Ghana, it will be an exciting experience. Tonight, top stars will invade the Kumasi City Mall to thrill thousands of music lovers till day break. Among the top performers are afro-dancehall musician Stonebwoy, dancehall star Shatta Wale, hiplife/afrobeats duo Dopenation, Kumasi-based rapper Flowking Stone, highlife songstress Adina, Tema-based rapper Yaa Pono, afrobeats newcomer Wendy Shay, gospel songstress Obaapa Christy, Kumasi top gospel star Kweku Gyasi, and other rising stars. The last time the VGMA Nominees Jam was held in the Ashanti Region was in 2012 with a line-up that included some of the big names in Ghanaian music; Okyeame Kwame, Buk Bak, Stay Jay, Obaapa Christy, SP Kofi Sarpong, Kwaw Kesse, and many more. Since then, the nominees party train has visited the Northern Region, Central and Western Regions, Brong Ahafo Region, Volta Region and other places. The event is sponsored by Vodafone and presented by recently adjudged Liqueur of the year at the maiden Ghana Beverage Awards, Kpoo Keke. The show will air live on TV3, YFM and DSTV.